Aristotle (philosopher and writer). He/she was born on 384 a. C. His/her birthplace is Macedonia. There is information in Classora Knowledge Base about 5 rankings, reports and surveys. Date of birth: 384 a. C.
Aristotle was born in Circa 384 B.C, in Greece, and passed away in 322 B.C. He is known for being a great Greek philosopher. He also created his own school where he put most his focus on teaching and writing. His school is the Lyceum, in Athens made in 335 B.C. He wrote notes and manuscripts with dialogues, about the studies of scientific and systematic works. He wrote about 200 documents, but only estimates 31 survived and are spoken about. Aristotle?s works were passed to his student Theophrastus and he passed them on to another student who kept them safe. 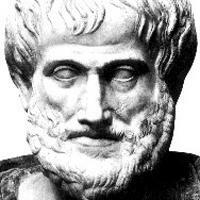 Aristotle main writings were systems for reasoning and for developing sound arguments. He also discussed matter and form, in his book Metaphysics. Twenty-three hundred years later Aristotle is still known in our generation. He is a founder of many things like formal logic, zoology, and apart of scientific methods. He tutored Alexander the Great, who later becomes well known for his acting.